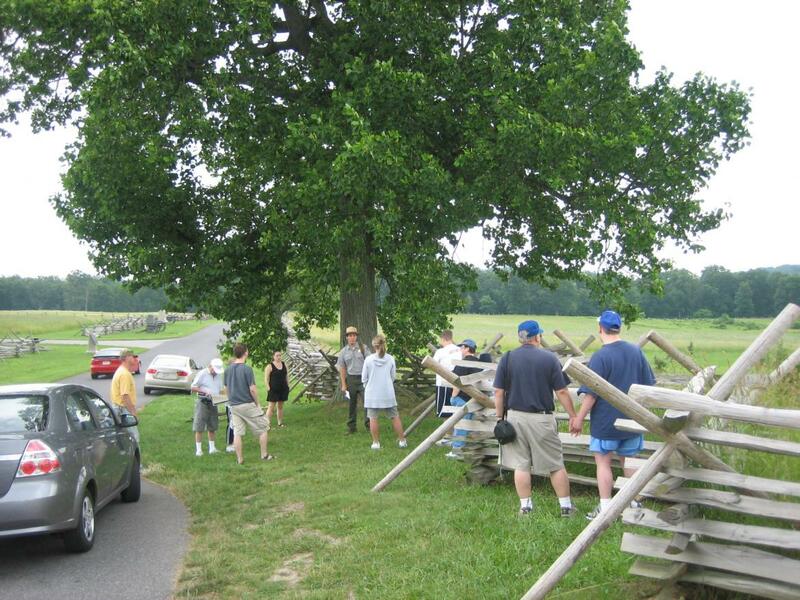 Gettysburg National Military Park’s Peach Orchard Ranger Program was presented at 2:00 PM by Christopher Gwinn. The group is shown at the northeast corner the Peach Orchard. 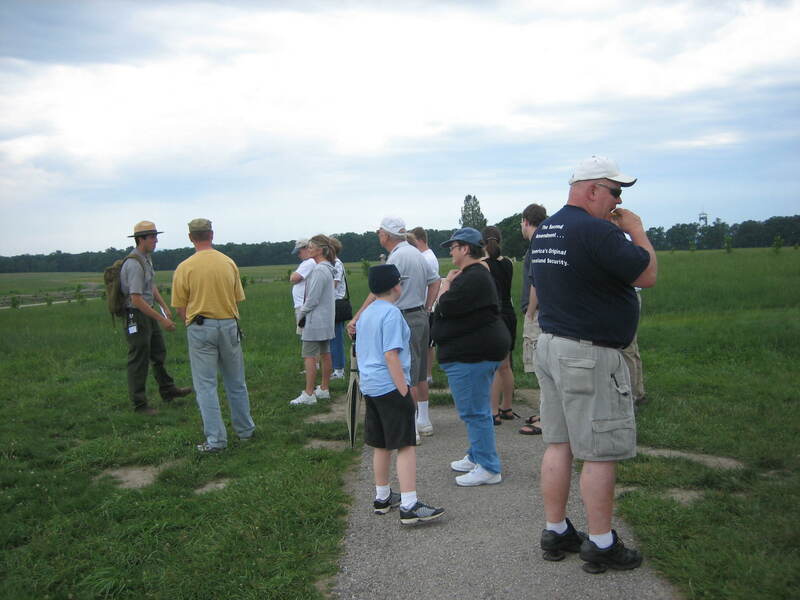 The Longstreet Observation Tower is in the right background on Seminary Ridge. This view was taken from the northeast facing southwest at approximately 2:10 PM on Monday, June 16, 2008. The Gettysburg Daily showed up at the Peach Orchard on Monday afternoon for some of the Peach Orchard Program presented by National Park Service Seasonal Ranger Christopher Gwinn. Unfortunately for Chris, lightning began to make its appearance, and the raindrops began falling, so the Gettysburg Daily left to return another day. Chris introduced himself to the group at the parking area northeast of the peach orchard, south of the Wheatfield Road, which is seen on the left. This view was taken from the west facing east at approximately 2:05 PM on Monday, June 16, 2008. Chris walked the group to the northeast corner of the Peach Orchard. He gave a background for the armies’ movements to Gettysburg. The monument to the 141st Pennsylvania is to the right. 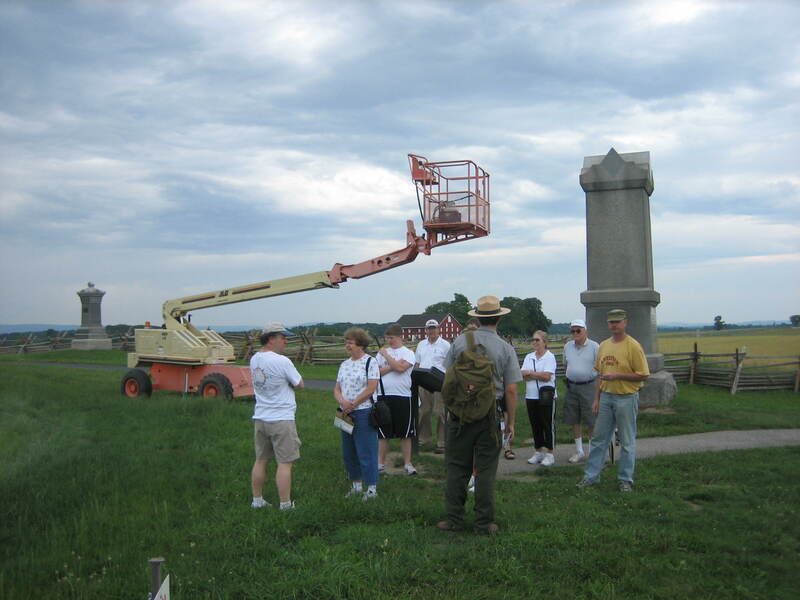 The monument to the 68th Pennsylvania is on the left, and the lift to power wash the monuments is prominently shown behind the group. The red Joseph Sherfy Barn is in the background. This view was taken from the southeast facing northwest at approximately 2:10 PM on Monday, June 16, 2008. 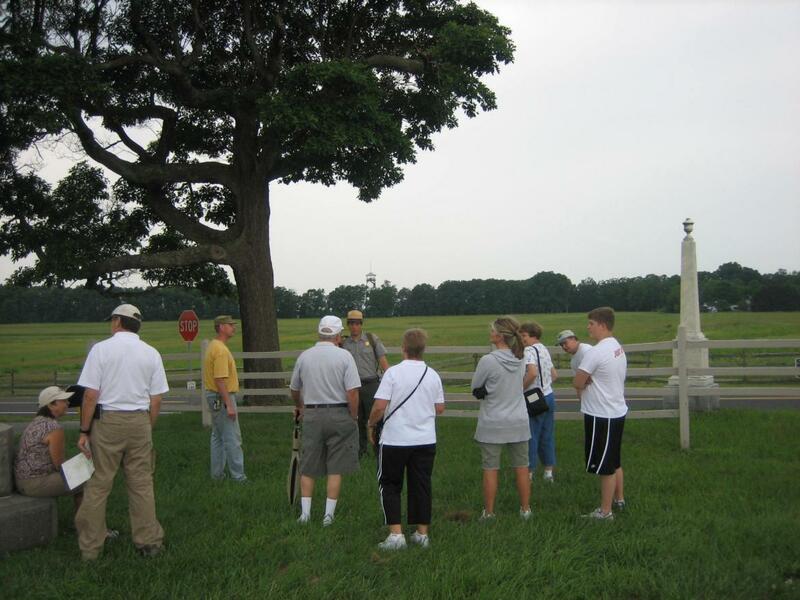 Chris then walked to the group to the southwest corner of the Peach Orchard to begin to explain Sickles’ reasoning and subsequent move to this area. The other monument to the 68th Pennsylvania is on the right. 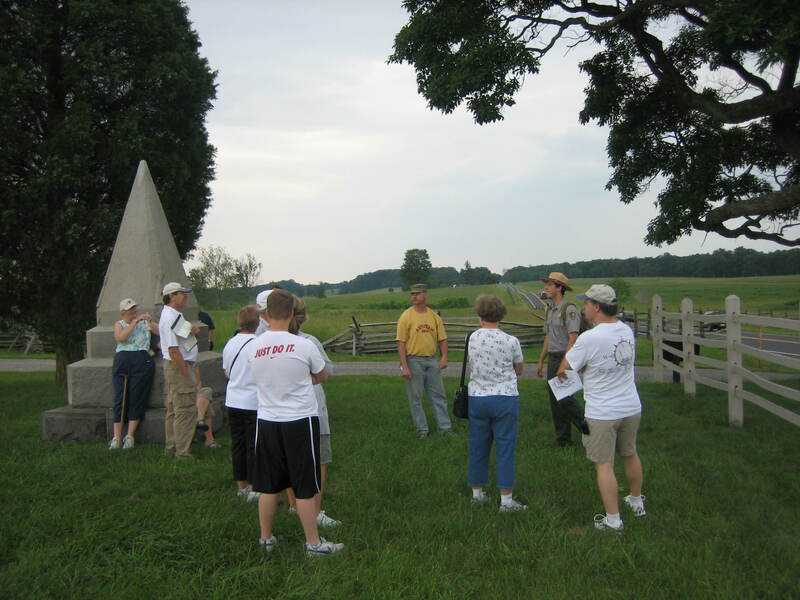 The Longstreet Tower is on Seminary Ridge in the background. This view was taken from the east facing west at approximately 2:15 PM on Monday, June 16, 2008. The rain began falling soon after this photograph, and the Gettysburg Daily decided to leave. The Emmitsburg Road is on the right. The monument to the 2nd New Hampshire Infantry Regiment is on the left. This view was taken from the north facing south at approximately 2:15 PM on Monday, June 16, 2008.